The Crees team records a three-metre boa constrictor: the first to be seen at our research and education hub, the Manu Learning Centre (MLC), in over five years. When our team of researchers noticed something strange crossing the trail en route to camp, they didn’t realise that it would be one of the most exciting recent discoveries at the MLC. At first, the ‘something’ seemed like a tree trunk, but when it moved suddenly and the team recognised it immediately as an immense boa constrictor: three metres of shimmering scales, ready to defend. 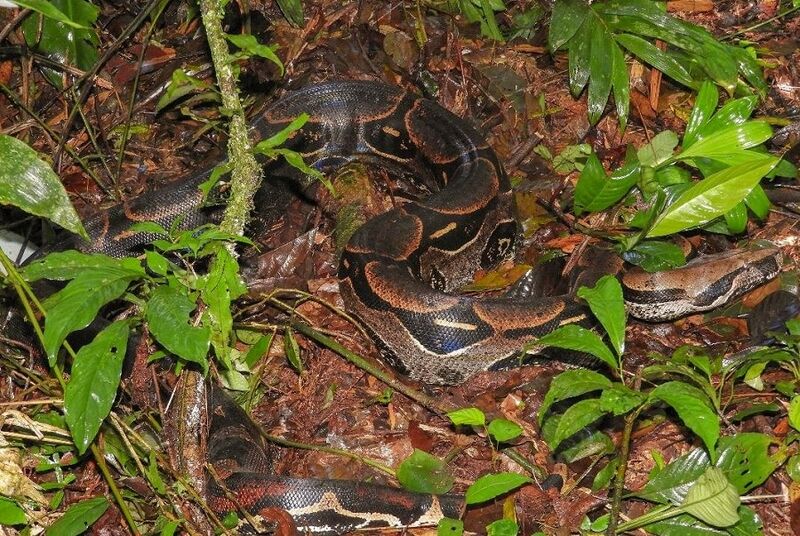 Red-tailed Boa Constrictor discovered at the MLC | Image © Diego Sanchez. Reptiles are one of several taxonomic groups studied at the MLC. They help us monitor the health of the forest, which has spent the past 30 to 50 years in natural regeneration after being disturbed by agriculture and selective logging. Our surveys allow us to better understand the exchange of energy in the forest. 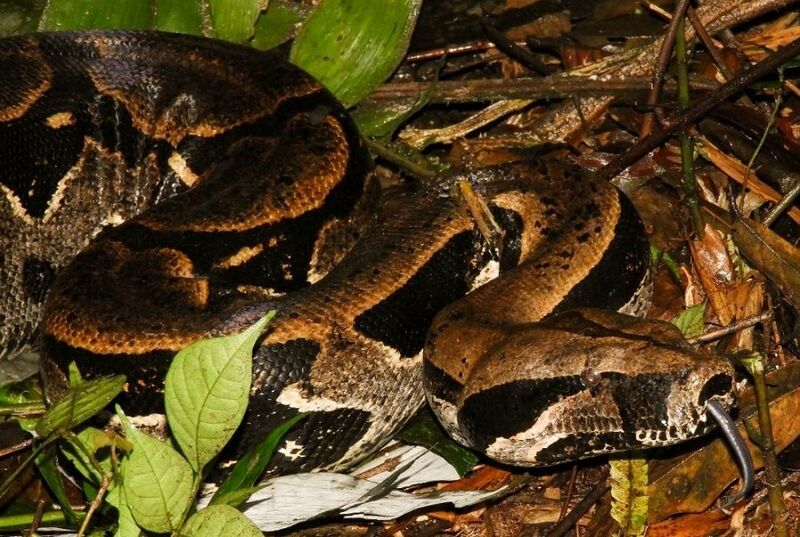 Reptiles like this boa constrictor, which prey on diverse species and are also part of the food chain for eagles and other large carnivores, are a symbol of a healthy and biodiverse environment. Our team and volunteers were amazed by the sheer size of this awesome creature | Image © Diego Sanchez. This discovery was the first of its type for over five years at the MLC and so the team were eager to measure and record the snake. Using a branch, senior field staff member, Christian, improvised a snake hook (used to catch snakes in a way that is safe for both the animal and people involved). At the same time, fellow field staff member, Juriko, ran nearly 4km to get a suitable container for transporting the massive boa safely back to camp (no mean feat in any rainforest, especially in the rainy season!). 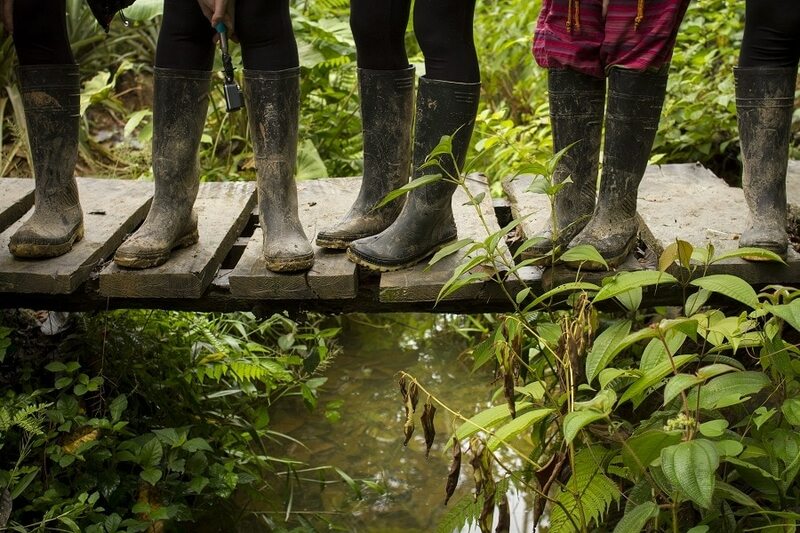 There’s a good reason why rubber boots are a everyday field wear in the Amazon. The next day, we carefully transferred the snake to a more open area for better control and began recording data. With such a large and potentially aggressive boa, this takes expertise and experience. She had an overall length of 2.9 meters and weighed in at 17.5 kilograms – a big surprise since the last specimen of this species found at the MLC was a much smaller juvenile. Staff, volunteers, locals and visitors alike marvelled at our majestic guest. After measuring, weighing and recording the data on this beautiful beast, the team returned her to her forest home | Image © Diego Sanchez. 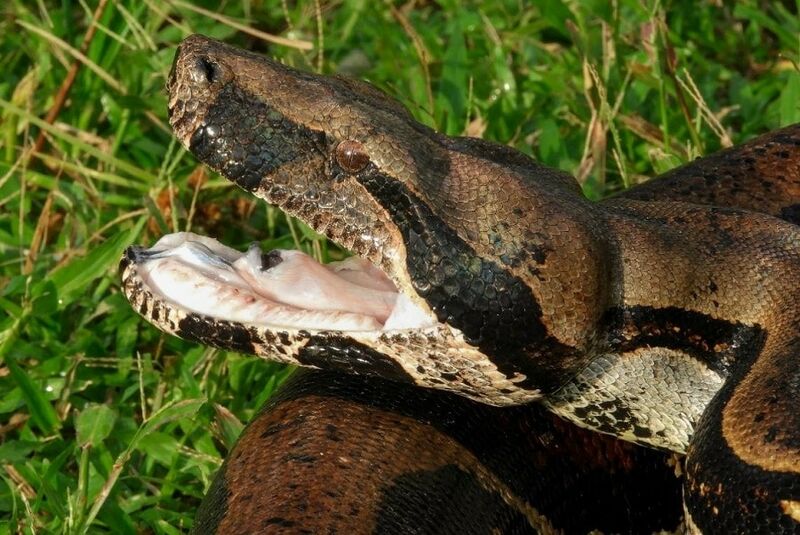 Boa constrictors are one of the biggest non-venomous snakes that exist. Adults normally measure 2.5 meters, although there are records of individuals reaching 5 meters. Unlike other snakes, the boa does not lay eggs, since fertilisation and egg development is internal. Their young feed on small mice, birds, small lizards and eggs and when they grow, the size of their prey also increases. Adults can eat large birds and mammals such as paca, small cats, capybaras and even small caiman, which they constrict by using the strong muscles of their body. After obtaining the data we needed, we returned the great boa to the same habitat in which she was captured. We waited until it became dark, since boas have ‘crepuscular’ (night time) activity, and when the moment was right, we released her. She seemed calm once out on her own and the team were happy to have accomplished our work and returned her to the forest. We survey the rainforest of the MLC every day, but it never stops surprising us. Sightings like this great boa are promising for its regeneration and it fills us with the motivation to continue working in conservation.